In my post yesterday I talked about the ABC Drivers of Intrinsic Motivation. (Achievement, Belief and Camaraderie). A sense of achievement is something you derive by, among other things, being in the job/role that is right for you and then being very good at it. The 2×2 grid (yes, blame it on the B-school stint) below shows how where you lie on the Role-Relevance and Role-Competency axes will determine your sense of achievement. 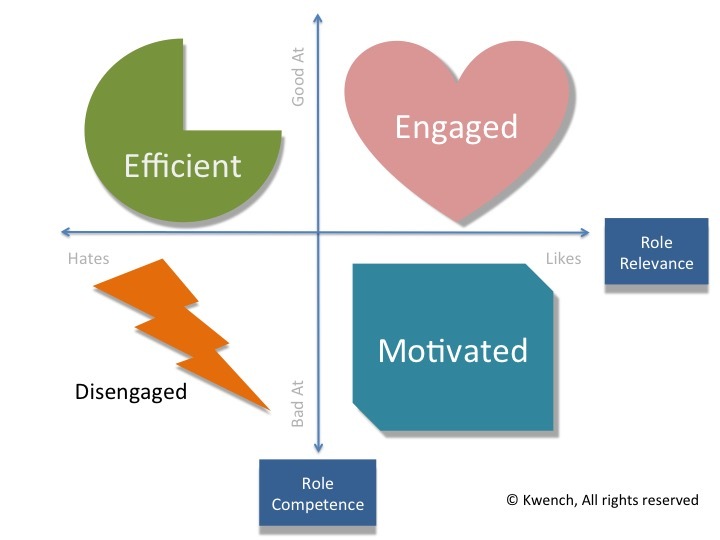 Relevance:Low, Competence:Low – Disengaged Employee: If an employee is in the third quadrant i.e he is placed in a role that he doesn’t like and also does not have the skills to perform then he is effectively being setup for failure and will be highly disengaged as he has little motivation to do a good job. If an employee finds himself in this situation then it is a failure of the organization and specially his immediate supervisors more than his own. Relevance:High, Competence:Low – Motivated Employee: When an employee is in a role or team which he wants to be in but is not trained for then he is motivated (but not competent). By providing the right training and support, employees who are in this quadrant can be easily moved into the ideal situation – into Q2. 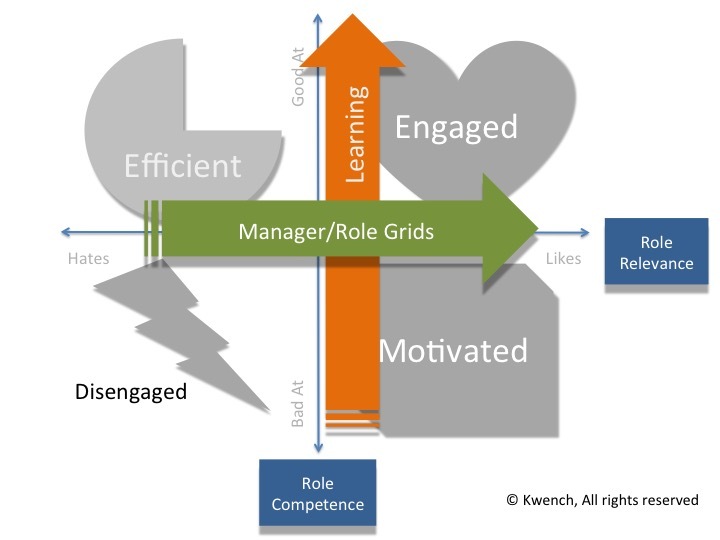 Relevance:High, Competence:High – Engaged Employee: This is when employees are motivated to give their best to the job. They are in a role they want to be in and have the required training and competence to deliver results. When employees are in this quadrant, their sense of achievement is the maximum. Companies on the 2013 list of Fortune 100 Best Companies to Work for, offered 66.5 hours of training annually for salaried employees, with around 70% of those hours devoted to employees’ current roles and nearly 40% focused on growth and development. Organizations that are not bound by rigid hierarchies and siloed org-structures have the flexibility to, better engage their employees by investing in training and having the opportunity to move them to roles they prefer. These are exactly the kind of facts that a good Employee Engagement Survey should throw up. It is not a coincidence that a majority of the top rated employers also have the highest investments in learning. These organizations know that investing in engaging employees with the right role and competency fit, also prevents a ‘brain-drain.’ Employees in all age-groups and roles need continuous support to expand their skills. Investing in skills and knowledge training, of employees communicates a sense of commitment by the organizations in the future of its employees and goes a long way towards fostering a sense of achievement. Reblogged this on The HR Partner @ HRO Partners.